MELINDA: So here we are, back to our regular programming after a few “special” weeks in a row. Feels a little strange, doesn’t it? MICHELLE: It feels totally strange! Where are all the babies and girls living in cellars?! MELINDA: Hm, when you put it that way, I’m grateful for a return to normalcy! So what have you got for us, now that we’re comfortably ordinary again? MICHELLE: A love story between two not-so-ordinary teens! 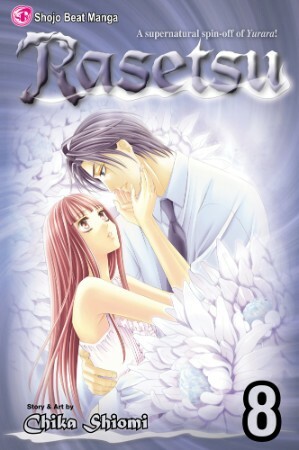 I’m talking about Portrait of M & N, by Gakuen Alice creator Tachibana Higuchi. I read its third and fourth volumes this week, and I have to say I am pretty frustrated. It’s like that old saying, “The opposite of love is not hate but indifference.” If I didn’t think Portrait was worth getting angry at, I wouldn’t bother, but it really could be so much better than it is and reading it can be a wearying experience because of that fact. Mitsuru Abe is an elegant-looking, if rather awkward, girl who has been belittled by her mother to the point that she has developed masochistic tendencies. The solitude arising from a sickly childhood, meanwhile, has led Natsuhiko Amakusa to develop a narcissistic fixation on his own beauty. The two meet, bond over their respective secret eccentricities, and eventually fall in love. If the story were solely about two people, different from others, who find love and acceptance with each other, I would probably like it a lot more. And, it’s true, sometimes the story does go in this direction, particularly in these volumes, where Mitsuru and Natsuhiko officially begin dating and immediately have to defend their relationship against Mitsuru’s disapproving family. Unfortunately, this series has a gimmick, and one that Higuchi cannot resist beating into the ground. When Mitsuru feels pain, a different personality takes over and she pretty much glomps whoever inflicted it. And whenever Natsuhiko spies his reflection in a mirror, he goes off on rhapsodies of self-adoration. I was tired of this by volume two, and the fact that it’s still the punchline in volume four leaves me shaking my head. And as if everyone is morons and can’t figure out what’s going on despite abundant visual clues and the fact that we’ve seen it many times before, Higuchi also adds helpful narration, like, “He sees himself reflected in the goggles.” I also don’t like Hijiri, an obnoxious classmate who likes Mitsuru, or the frequent breakage of the fourth wall. And yet, I wouldn’t say I dislike Portrait of M & N. It’s disappointing. It’s maddeningly frustrating. But sometimes, it’s kind of good. And it’s because of those glimmers that it’s worth reading. MELINDA: Oh, ugh! I was thinking, “Wow, this actually sounds really good, what kind of crack is she smoking?” all the way up until you got to the part about the gimmicks. I mean. WHY? It’s as though the mangaka thinks that the characters’ issues need to be exaggerated in order to be interesting, when actually the opposite is the case. They’d be much more interesting if they were allowed to just be real, and we could watch the two of them learn to deal with each other and themselves. Ugh. MICHELLE: Exactly. Sometimes, I feel like I come down too hard on comedies, but there’s a difference between injecting humor into a story that feels like it’s going somewhere—Silver Diamond consistently makes me giggle, for example—and substituting hijinks in place of actual plot momentum and character growth. This manga is much better when focusing on how the leads have changed because of their relationship rather than how they contend with the irksome antics of Hijiri. Annnnnyway, what ordinary things have you been reading lately? MELINDA: Oh, you know, the usual. Ghosts. Curses. Lots of cake. Yes, I’ve indulged myself over the last few days with my latest Pick of the Week, volume eight of Chika Shiomi’s Rasetsu. Though Rasetu’s actually found true love, it would seem, just in time to save her from the demon who claimed her as his own however many years ago, it also seems likely that the whole thing was a ruse from the start. Not even true love can save Rasetsu from her fate, especially when one of her allies may not be as he seems. The truth behind one of Rasetu’s ghost-hunting colleagues is finally revealed, and though it’s something I guessed on my own quite a long while ago, Chika throws in some twists that are stunning just the same. And that’s really the secret to this entire manga. Though the surface elements are very much standard for supernatural shoujo (and romantic shoujo as well, of course), the execution is so fresh and charming, it feels anything but standard. It’s got the comfortable familiarity of a tried-and-true formula, but without the usual pitfalls, which in my mind, is what makes a really good genre series. Interestingly, too, though we’ve finally hit the best bits of romance here in the series’ penultimate volume, what really shines here is the larger conflict between Rasetsu and her demon predator. For a romance junkie like me, that the rest of the plot would even register at this point is a pretty big deal, so for it to actually grab my focus for the bulk of the volume is significant. I really enjoy this series, and I’m on the edge of my seat waiting for its final volume. MICHELLE: I really appreciate how you’ve stoked my desire read this series but have almost entirely avoided spoilers at the same time. It almost sounds like Buffy, in that you’ve got these supernatural things going on, and some of them are dire, but the focus is always on the characters, their relationships, and how they are personally affected by whatever the spooky plot happens to be. MELINDA: Well, I would say it stops short of the full greatness of Buffy, primarily because it isn’t long enough for the kind of character development that series was able to accomplish, but it’s definitely character-driven and also quite a bit of fun when it’s not in its deepest moments of angst. Well, actually, sometimes it’s fun then, too. I always feel like I need to mention that it gets a slow start, because really the first volume is nothing to get excited over. But it has definitely become a favorite for me over time. So, what other mundane item have you got in store tonight? MICHELLE: The thoroughly humdrum tale of a bunch of kids who take turns piloting a giant robot in battles against alien invaders! 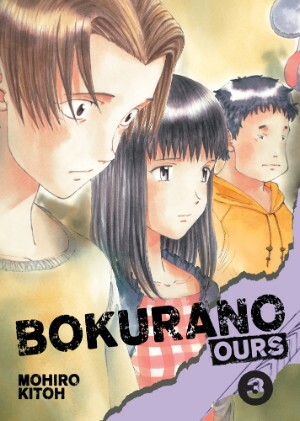 I’m talking about Bokurano: Ours, specifically its third volume. Sometimes I feel like I’m alone in my interest in this title. It’s true that it has issues. Most fundamental for some will likely be the fact that “Zearth,” the robot, is powered by the life force of its pilot, which means that kids die. If one can get past this, there’s also the problem that we seldom learn anything about a given kid until it’s their turn to pilot, which means there are a lot of characters sitting around observing the action without really participating much in it. Besides all this, the military has now gotten involved, and their assistance initially gives the current pilot—a neurotic kid named Kako—hope that he might not have to die. When this hope is quickly dashed, he goes berserk, but if he fails to complete the battle in the allotted time frame, Earth will be destroyed! Dun dun dun…. Basically, the main appeal of Bokurano: Ours can be boiled down to, “What the hell is going on? !” Some series that try this approach lose me along the way, but here, I am genuinely interested. My only lament is that volumes do not come out faster, so it will take ages for us to get to the eleventh and final volume where, presumably, concrete answers await. MELINDA: Well, hmmmm. I must say this does sound pretty interesting. Now, I tend to appreciate grim stories, so not even the child deaths deter me here, and I admit I’m a little fascinated by the horror that poor kid Kako must be going through. How do they muster the will to keep going when they know they are doomed? I would find that so difficult. I’d go berserk in a second. I’m kind of intrigued. MICHELLE: That’s dealt with in an earlier volume, when Koyemshi tells them that if they refuse to fight or lose on purpose, Earth will be destroyed. So, either way, they’re going to die. They can either die while protecting the people they care about or they can or they can die alongside them. No pressure, kid! For those who are intrigued, a few chapters are available online at VIZ’s SigIKKI site. MELINDA: That’s horrifying! And kind of awesome. I’m definitely intrigued. MICHELLE: There’s even more horrifying stuff going on, but I can’t reveal everything! 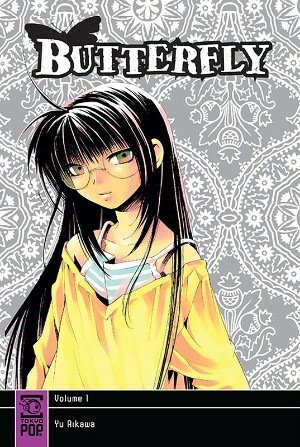 MELINDA: Well, actually, I read the first volume of TOKYOPOP’s new series, Yu Aikawa’s Butterfly, which I have to say is one of the oddest little manga I’ve ever read. And I mean that in the best way possible. Ginji Ishikawa is a high school student who sees the vision of his dead brother every night in bed. Since Ginji’s primary method of dealing with upsetting things is denial, this means that he bases his entire life on the premise that ghosts can’t exist–or anything that smacks of the occult, for that matter. This belief, in fact, is the biggest factor behind his failure with girls, since he absolutely rejects anyone with even the mildest interest in the supernatural, from haunted houses to horoscopes. It’s strange then, when finds he’s being followed by an elementary school girl who insists that he become part of her ghost-busting business. Sounds pretty standard, right? I mean, it’s quirky, sure, with the ghost busting and all that, but nothing really strange so far. But that’s only because we haven’t covered yet that the little girl isn’t actually chasing ghosts, but rather living hallucinations she’s able to create out of other people’s thoughts, which she uses to con unsuspecting folks into hiring her as an exorcist. 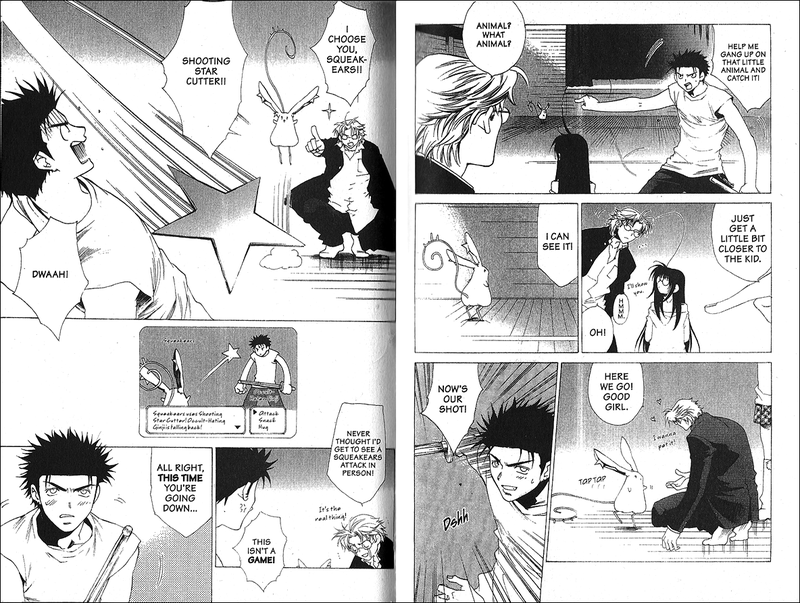 And that the reason she needs Ginji is that his stubborn denial makes him capable of actually destroying her creations (like seriously, by fighting them in one-on-one combat), something she can’t do herself. And have I mentioned that one of the hallucinations is cute little game character called “Squeakears” (see below), apparently loved by all Japan? And that the little girl is not even a little girl? As weird as this series is, it’s also really interesting. The characters are all filled with dark little nooks and crannies they’re struggling to hide from everyone else. And the story behind Ginji’s brother’s death is more than spooky. Even Ginji’s odd James Spader-type best friend has some kind of mystery lurking beneath. It’s just the strangest little story, but I really can’t wait to read more. MICHELLE: Oh, I’m so happy to hear good things about this! Sometimes it can be hard to tell whether a new TOKYOPOP series is going to be good or bad, and this is one that I had some trepidations about. What a delight to instead be reassured! MELINDA: It’s strange, it really is, so it may be an acquired taste, but man, have I acquired it. I was really thoroughly charmed. MICHELLE: That’s the plus side of low expectations—you can really fall in love in a surprising way. TOKYOPOP has done that to me several times. MICHELLE: It’s always a good thing to find a series to love! 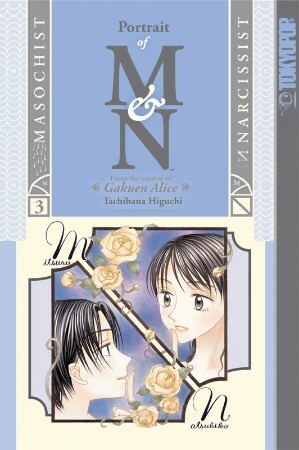 While I am a big fan of Higuchi Tachibana’s Gakuen Alice, I didn’t find myself enjoying her Portrait of M & N. I only read the first volume and decided not to collect the rest as I didn’t enjoy it all that much and definitely not something I would re-read. Rasetsu is something I love and enjoy. While I did enjoy the prequel Yurara, I found myself loving Rasetsu even more especially that my favorite character, Yako is a main character in the series. I have been in love with him since reading Yurara. I actually love all the characters in Rasetsu and while I have always loved Yako, I have a soft spot for Kuryu. Volume 7 was so touchy that I teared up a little. I have been having my doubts about the identity of Rasetsu’s demon and I think I was right after all. Can’t wait to get volume 8 this week and then the last volume in June. 1. It’s short (six volumes). It’s definitely not something I would consider a keeper, and I’m pretty sure my local library will be receiving my set for inclusion in their own manga collection once I’ve finished. I love three out of the four series you covered this time. How likely is that? I just read volume 8 of Rasetsu yesterday. With a silly grin on my face for most of the duration of the book. I still haven’t gotten the third volume of Bokurano but I enjoy the series very much, just because it’s so dark and twisted. I can’t argue against the negative points but I love it despite those. I’m so glad you gave a positive review of Butterfly! I have the first two volumes of it in my native language but it seems that the local publisher has gone MIA and it’s not likely that there’ll be more. So I hope that enough people buy the first volumes in English so that I can get the rest in a language I understand. It really is a charmingly quirky tale and manages to dodge so many of the potential black holes in the premise. And while the plot is all about ghosts on the surface, the main draw is the wonderful, nuanced characters. Yay, a fellow Bokurano fan! Michelle, you are definitely not alone about Bokurano! It’s one of my favorite series. Kitou is always so good with balancing human cruelty with human kindness, and Bokurano is sort of the coup de grace of that. Kako’s storyline was one of the first signs, for me at least, that the series had even more in store than what the first couple of pilots seemed to suggest. He’s so real, and not at all brave or heroic or praiseworthy, but that’s just how I would have acted in his place, so I can’t blame him. (The concrete answer you’re waiting for? It’s indefatigably, exhaustively terrible, in the best way possible.) And! It’s the perfect subversion of the giant robot genre! You’d never see this kind of trick in the Gundam franchise. Not even Eva went that far. Maki’s battle is when the metaphorical crap really starts hitting the fan, and that’s volume 5. During her battle, my jaw definitely dropped, and I started screaming NO WAY at the manga repeatedly. The next couple of pilots are the most horrifying stories ever, seriously, and the ending of it was soul-draining that at the time I was compelled to force my roommate to listen to me explain it in depth just so I could share my pain, haha. SO PLEASE KEEP WAITING, MICHELLE. It’s an amazing series (with one of the worst anime adapations ever). But… I liked your thematic discussions! With all the Tezuka and Furuya in the pipeline for 2011, I’m sure you can find something even more outrageous than Ayako on which to train your sights. I’m marking my calendar in full anticipation of Lychee Light Club and No Longer Human getting the Off the Shelf treatment! More love for the dark gem that is Bokurano. I’ve been hooked since that first audacious volume, full of so many “The author did NOT just do that!” moments. :) And then came the horrific revelations of the second volume. Bless you, Viz for taking another chance on this author. Here’s hoping your successfully hook a paying audience. I hope they hook an audience, too. It’d be a shame for Kitoh to have *another* partial series situation here. I actually feel the exact opposite about M&N – I want it to be more over the top. The characters are all wrong for the masochist/narcissist plot she’s developed, and I think it would be much funnier and serve her plot better if they were louder, brasher, and generally funnier. As it is, you merely sort of pity them. It has a tonal dissonance that I just can’t get over.